“America the Beautiful” was one of several songs performed by soul singer Aretha Franklin and former U.S. Secretary of State and classical pianist Condoleezza Rice at a recent one-time only performance with the Philadelphia Orchestra. The 2-hour concert shared by this dynamic duo reminded me how truly beautiful America is. 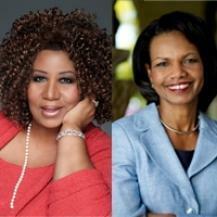 Before the performance I was curious how Ms. Rice and Ms. Franklin would share the stage. How exactly do you compose a musical program of classical and soul, diva and conservative, Democrat and Republican? I wasn’t the only one anxious to find out. Nearly 8,000 people filled the seats and sprawled the lawn at the Mann Center in Philadelphia to hear these unique artists. It was a beautiful site not only because proceeds from the tickets were a benefit for children in music and arts, but also beautiful because of the diversity of the audience. It was a joyous gathering of people of different ages, ethnicities, religions and political affiliations. I doubt anyone cared. What mattered were the melodies. It’s amazing how music just does that. The diversity of the audience was matched by the diversity of the musical selections played. The Philadelphia Orchestra opened with a soothing “Candide” overture, later followed by a variety of genres. Classical, soul, gospel hymns, and even opera crossed the lips and or finger tips of Ms. Franklin and Ms. Rice. The audience was pleased. A sea of heads bobbed, swayed, and at times some even looked to the heavens in praise. Hands clapped, fingers snapped, a few hundred air tambourines played along, I’m sure. It was a small reflection of the diversity of our country; the diversity of its people and its talents—coming together to celebrate music and the arts. Music has the power to make us all feel as one. Though some of us prefer certain sounds or instruments over others, music in general is a non-partisan magic that brings us all together… from sea to shining to sea.